Breast cancer is the most common cancer among women in the world. According to the World Health Organisation (WHO), for the majority of women presenting with breast cancer, it is not possible to identify specific risk factors. Recently, Hollywood actor Angelina Jolie was in news after she underwent a double mastectomy following her learning that she was at risk for both breast and ovarian cancer. It was a genetic test that revealed she carried the mutated BRCA1 and BRCA2 genes. So what is this test all about? About five per cent of breast cancers are caused because of mutations in specific genes in cells of our body. The most common are mutations to the BRCA1 and BRCA2 genes (BRCA stands for Breast Cancer. These two genes are Breast Cancer susceptibility genes). Both these genes are DNA-repairing genes. For example, they repair a cell that is damaged because of exposure to the sun’s radiation. These genes are present in everyone, young and old, men and women. If there is a defect in this gene, if it is mutated, it becomes dysfunctional and slowly becomes cancerous. What exactly causes the gene to mutate, become dysfunctional and cancerous, is not known. About 95 per cent of breast cancers are because of risk factors including obesity, lack of exercise, first pregnancy after the age of 30, nulliparity, administration of hormonal pills and intake of estrogen supplements. The risk increases with age. In addition to carrying the mutated gene, if one has any one of the above factors, the risk of getting cancer increases. While only five per cent of breast cancers are caused by the gene mutation, if one has a family history of cancer, there is the option of checking if one is carrying the defective BRCA1 or BRCA2 gene. This is done through genetic testing. It is a simple blood test. It takes about 10 to 12 days for the results to be determined. It tells us whether the BRCA1 and BRCA2 genes are mutated and you can thereby determine the risk of breast cancer or ovarian cancer. Who needs to undergo a genetic test? If several members in your family have had breast cancer or ovarian cancer, or in rare cases cancer of the prostate, brain cancer or colon cancer. If a family member has had both breast cancer and ovarian cancer together or one after the other. If your mother or sister who already has cancer is surviving, one option is to test them for the mutated gene. However, if several persons in a family have cancer, it is not necessary that they are all carriers of an inherited defective gene. In general, one in every 20 women develop breast cancer. Every year, one in every 100 women who have the defective gene will develop breast cancer. 15 % of those who have a defective BRCA1 gene will not get breast cancer. 60 % of those who have a defective BRCA1 gene will not get ovarian cancer. 40 % ovarian cancers are caused by the defective BRCA1 gene. 20-30 % of ovarian cancers are caused by a defective BRCA2 gene. If the test determines that the genes are mutated, then based on experience and statistics, doctors can determine the extent of risk. This will however be an approximation. So if you are 30-years-old, you will be at 0.5 per cent risk of developing the cancer, for each year. If you reach 40 years, it will be 1 per cent risk each year. The risk increases with age. The highest risk will be when one is 90 years of age. If you have a 60 per cent risk, it means that the 60 % risk is when you are 90-years-old. That said, the statistics claims that one in every 100 people who have the defective BRCA1 gene will develop cancer every year. Your chances increase, as you grow older. At Manipal Hospital, located on Old Airport Road, the test is done at a cost of approximately Rs 12,000 for testing one gene. For both BRCA1 and BRCA2 genes, the cost is Rs 25,000. 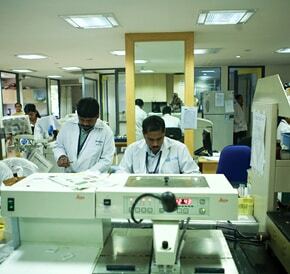 At HealthCare Global, located in Sampangiramnagar, testing one gene costs Rs 50,000. For both genes, the cost is Rs 80,000. Health insurance does not cover the cost of this test. What is more important is to cope with the result once it is out – especially when one finds that the said genes are defective. It could cause psychological stress. If one family member tests positive and another tests negative, it could result in a feeling of guilt. It can cause fear in those who test positive. Hospitals provide counselling ahead of cancer treatment. Even before the test is done, an oncologist will help one decide if the test is even necessary. You can follow-up and decide on a course of action once you develop cancer. If one does not have a strong family history of breast or ovarian cancer, say, if only a mother has had cancer and no one else has, the daughter is still twice at risk than the average person. In such a case, the daughter can undergo surveillance from about ten years before the age of when the family member was diagnosed. You can undergo an ultrasound and mammogram. While breast cancer cannot really be prevented, a healthy lifestyle will definitely help. This includes regular exercise, vegetarian food and limited consumption of alcohol. In Bangalore, the test for BRCA1 and BRCA2 is done at the HealthCare Global (HCG) Enterprises Ltd in Sampangiramnagar and at the Manipal Hospital on Old Airport Road. Not only women are diagnosed with breast cancer, men can also be diagnosed with it. Know more about breast cancer. What about SNP testing? It is said that it gives relative risk prediction for many disorders and that it need only saliva to test. It is done in Australia and further support is also provided. I found it on http://www.wellnessbangalore.com. When contacted, the cost given was Rs. 70,000. What is your opinion about this?